Part of the mission of ACT is to offer educational opportunities to community members through participation in productions, workshops, and classes throughout the year. Both paid and free upcoming classes are listed below. Reserve your place with a card online, via phone Monday-Friday at (803) 648-1438, or stop by the box office at 126 Newberry St SW in downtown Aiken. Do you have a suggestion for a class or workshop? Interested in teaching? We encourage you to share your ideas! Contact us at info@aikencommunitytheatre.org or 803-648-1438. 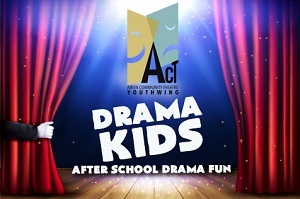 Bring your kids for after school drama fun! During Session 1 and Session 2, kids will be learning a scene to then perform for their family on the last day of class in that session. During the Mini Session, kids will be learning all about theatre and what it means to be in a show through games and scene work. The objective of the classes is to teach children about how to be more confident, use their voices more effectively, take direction, and have a great time while also building teamwork skills!